Arthur Lloyd, who is British, came to Japan in 1884 as an Anglican missionary for the Society for the Propagation of the Gospel (SPG). Ten years later, in 1894, he became a missionary for the Domestic and Foreign Missionary Society of the Protestant Episcopal Church in the USA, and engaged in missionary work for nine years until 1903. Lloyd graduated with excellent results from the University of Cambridge, holding a bachelor’s degree and a master’s degree. He was said to speak fifteen languages, and was preaching in Japanese only seven months after arriving in Japan. Recognized by Yukichi Fukuzawa from the beginning as a truly unique scholar among the teaching staff of Keio Gijuku (Keio University), Lloyd taught there for 11 years (1885-1890, 1893-1898, and 1904). 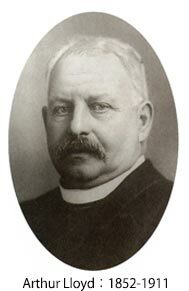 On the invitation of John McKim, mission overseer of the Protestant Episcopal Church in Japan, Lloyd served for five and a half years (December 1897-April 1903) as president of Rikkyo Gakuin, which was of the same denomination. During that period, Lloyd overcame the problem of the Ministry of Education’s Directive No. 12 in 1899, which banned religious education at government-accredited schools, by his policy of observing the directive so long as Christianity could be indirectly taught to some extent on campus. As a result, Rikkyo maintained its accreditation and continued to be able to grant students access to higher education and exempt them from military conscription. At the same time, Lloyd established an educational policy of strengthening Rikkyo’s general education, resulting in St. Paul’s Middle School becoming the only school where all students (11 students) taking the high school entrance examination passed a year after proclamation of the directive. This was the best performance in the whole country, with no other school getting more than half of its examinees through the examination. St. Paul’s Middle School went on to become the largest mission school in Japan today, which was a major factor in later opening up the way for the foundation of St. Paul's College, Tokyo (1907) under the government’s Acts of Colleges. In addition to his work at Keio and Rikkyo, Lloyd also taught at the Imperial Naval Medical College, the Imperial Japanese Naval Academy, Tokyo Senmon Gakko (currently Waseda University) and the Tokyo Higher Commercial School (currently Hitotsubashi University), and succeeded Lafcadio Hearn as professor of English literature at Tokyo Imperial University (currently the University of Tokyo). Lloyd published English translations of Japanese literatures, such as “Gold Demon” (“Konjiki Yasha”) by Koyo Ozaki and “Nature and Man” (“Shizen to Jinsei”) by Roka Tokutomi, as well as a series of Buddhist studies. His Buddhist research papers were considered required reading as late as 1956, after World War II. He was also famous as a scholar for his articles in the “Transactions of the Asiatic Society of Japan” and countless other Japan-related publications. Lloyd passed away on October 27, 1911, and his funeral was attended by more than 300 mourners from educational and religious circles, which was evidence of how widely recognized he was in this foreign country, Japan.